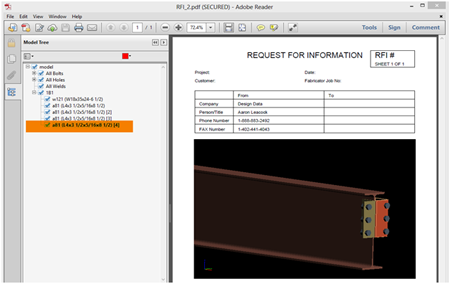 To create an RFI containing a 3D model, select Create RFI from the File pull-down in Modeling. Users can select individual members to be included in the resulting PDF file, and can also choose to include bolts, holes, welds and material information. To quickly fill out an RFI, SDS/2 also has Copy/Paste/ Save/Load options that can be used with default information such as the company name and contact information. SDS/2 has an option to create an additional XML file that can be used with FabSuite software to track RFIs. If you have any questions about how to create RFIs, please contact your SDS/2 support representative.